Sesame seeds are seeds from the sesame plant. When the pods of the sesame plant mature, they burst open, inspiring the famous phrase: "Open Sesame". Sesame seeds are added to salads for a nutty texture and flavor. Ground toasted sesame seeds are called Tahini and is added on to make Hummus. Choosing: Just as with any other food that you can purchase in the bulk section, make sure that the bins containing the sesame seeds are covered and that the store has a good product turnover to ensure maximal freshness. 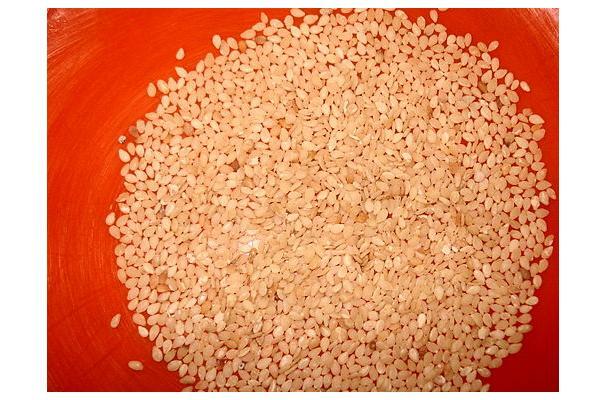 Buying: Sesame seeds are generally available in prepackaged containers as well as bulk bins. Use the traditional macrobiotic seasoning, gomasio, to enliven your food. You can either purchase gomasio at a health food store or make your own by using a mortar and pestle. Simply mix together one part dry roasted sea salt with twelve parts dry roasted sesame seeds. Sesame seeds add a great touch to steamed broccoli that has been sprinkled with lemon juice. Spread tahini (sesame paste) on toasted bread and either drizzle with honey for a sweet treat or combine with miso for a savory snack. Combine toasted sesame seeds with rice vinegar, tamari and crushed garlic and use as a dressing for salads, vegetables and noodles. They are also the main ingredients in tahini (sesame seed paste) and the wonderful Middle Eastern sweet call halvah. They are available throughout the year. Sesame seeds may be the oldest condiment known to man dating back to as early as 1600 BC. They are highly valued for their oil which is exceptionally resistant to rancidity. "Open sesame," the famous phrase from the Arabian Nights, reflects the distinguishing feature of the sesame seed pod, which bursts open when it reaches maturity. The scientific name for sesame seeds is Sesamun indicum. On a global basis, and especially in countries like Canada, Japan and Israel, the past 10 years have been characterized by increased prevalence of sesame seed allergy. History: While sesame seeds have been grown in tropical regions throughout the world since prehistoric times, traditional myths hold that their origins go back even further. According to Assyrian legend, when the gods met to create the world, they drank wine made from sesame seeds.